There’s no better way to explore Paris than on a Velib bicycle! My first experience of Paris Public Transport was the Metro. I couldn’t believe its speed, efficiency and convenience. Furthermore, it took me off the streets and out of the way of those anarchistic Parisian motorists. Better still it took them out of their cars and off the roads. Not enough of them, however, as eighties roads in the great city were always clogged with noisy, smelly vehicles, driven like dodgem cars, by homicidal maniacs with a death wish. Not so nowadays. 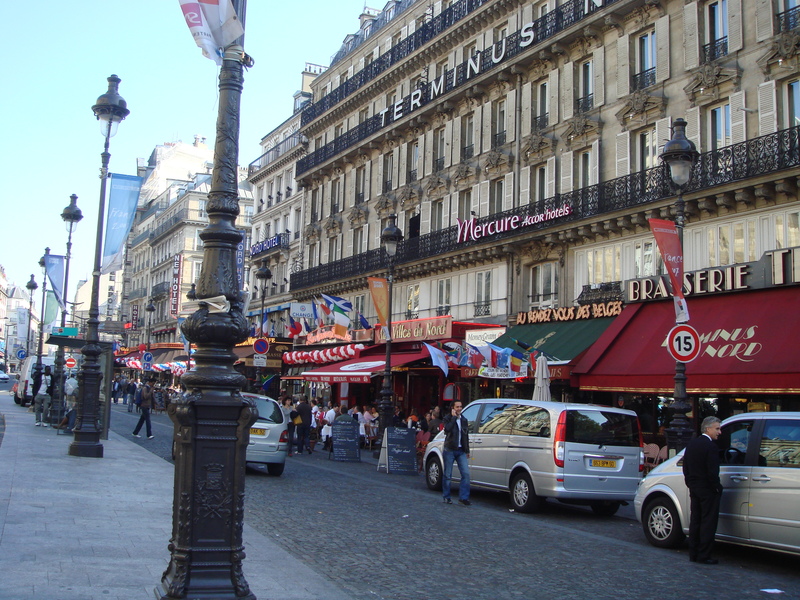 The streets of Paris are noticeably quieter, less congested and crossing them is no longer life-threatening. The city of Paris has battled on many fronts in the war against traffic. For years there have been carless days, car curfews, car reductions, carless streets, le roller du vendredi soir (Friday night roller rally), two wheel zones, pedestrian zones, walking paths and bike paths. Still, one of the most successful, convenient and fun initiatives to date has been Velib’ . This self-service bicycle scheme which takes its name from velo – bike and liberte – freedom, has as its catch cry “Thousands of bicycles in Paris give you lib’erty” and indeed they do. There is a Velib’ station every 300 metres and there are thousands of bikes available 24/7, to all, residents and visitors alike, over 14 years of age. It’s an interesting spectacle to see groups of young people heading off heading off on a night out, the businessman, tie flapping, laptop in his dinky little front basket, racing to a meeting, the immaculately groomed Madame with her hand bag over her shoulder cruising off to lunch, or the tourist, camera round his neck, beret on his head, “J’aime Paris” emblazoned on his T shirt, wobbling uncertainly over the cobble-stones. Using velib’ is simple. Take your Visa, Mastercard, American Express, JCB, Visa Electron or Mastercard Maestro down to the nearest Velib’ station where the information, reservation and payment terminal will guide you through the steps to obtain your 1 day, 1 week, or 1 year subscription. You will then be issued a ticket with your subscriber code which will allow you to take your bike, ride it as far as you like and drop it at the Velib’ station at your destination. Velib’ is cheap. A 1 day ticket will cost you 1 euro, a 7 day ticket 5 and a 1 year ticket 29. The first 30 minutes of use is free, an additional half hour costs 1euro, a second half hour 2 euros and every half hour after that 4 euros. At any time you can tally up the total of your velo on the terminal at any station. What better way to see Paris, than on a Velib’ bike? Still uncertain of the Paris traffic? Take advantage of the 371 kilometres of cycle lanes to ride around Paris “en toute securite” – safely and with complete peace of mind. Remember, too, cycling, as the Velib’ brochure says, makes the city beautiful.